Frank Hintz: What is the origin of the word “tip” (as in leaving a tip)? You may have heard that the few hundred year old definition of “tip”, as referring to gratuity, comes from “To Insure Promptness” or similar backronyms, but this isn’t correct. There is only one known pre-20th-century [English] word with an acronymic origin and it was in vogue for only a short time in 1886. The word is “colinderies” or “colinda”, an acronym for the Colonial and Indian Exposition held in London in that year. The real origin of the word “tip” is a bit more obscure than that. In terms of the “gratuity” definition, it most likely comes from a popular form of speech among thieves, beggars, and hustlers, called the “Thieves’ Cant” (also sometimes called “Rogues’ Cant”), which arose in Great Britain several hundred years ago with the primary aim of keeping non-thieves and the like from being able to fully understand what the thieves were talking about. I buzzed a bloak and a shakester of a reader and a skin. My jomer stalled. A cross-cove, who had his regulars, called out ‘cop bung’, so as a pig was marking, I speeled to the crib, where I found Jim had been pulling down sawney for grub. He cracked a case last night and fenced the swag. He told me as Bill had flimped a yack and pinched a swell of a fawney, he sent the yack to church and got three finnuffs and a cooter for the sawney. I picked the pocket of a gentleman and lady of a pocket-book and a purse. My fancy girl stood near me and screened me from observation. A fellow-thief, who shared with me my plunder, called out to me to hand over the stolen property, so, as somebody was observing my maneuvers, I ran away to the house, where I found James had provided something to eat, by stealing some bacon from a shop door. He committed a burglary last night and had disposed of the property plundered. He told me that Bill had hustled a person and obtained a watch; he had also robbed a well-dressed gentleman of a ring. The watch he sent to have the works taken out and put into another case (to prevent detection), and the ring realized him three five-pound notes and a sovereign. One such slang word in this Thieves’ Cant was “tip”, meaning “to give or to share”. The first documented usage of “tip” this way dates back to 1610. As to the ultimate origin of the word “tip” in English, meaning anything, it first popped up in the 13th century meaning “end, point, top”, probably from the Middle Dutch word “tip”, meaning “utmost point or extremity”. In the United States, you can potentially be arrested for refusing to pay a mandatory “tip” as happened to Humberto A. Taveras when he dined at the Soprano’s Italian American Grill in New York. He failed to leave sufficient funds to cover the mandatory tip of 18%, instead leaving a tip of 10% (the original bill was $77.43). Taveras stated that his group didn’t feel the food was very good, so he didn’t feel like leaving a large tip. This 8% discrepancy resulted in the owners of said restaurant, Joe and Tina Soprano, calling the police and having Taveras arrested and charged with “theft of service”. On principle, Taveras went ahead and hired a lawyer, rather than just pay the discrepancy and fines and fought the charge. He won without going to court as the District Attorney threw out the case stating that tips can never truly be mandatory, regardless of posted signs in a restaurant or restaurant policy. Another case of someone being arrested in the United States for lack of paying a mandatory “tip” was the case of John and Pope Wagner after dining with six friends at the Lehigh Pub in Bethlehem, Pa. There was a listed mandatory tip of 18% for a group that size, but as they had to wait over an hour before the food they ordered was served; they had to go to the bar to get their drinks refilled as the waitress was nowhere to be found; and they had to get their own silverware and napkins from other tables as the waitress never came back when they requested them, they decided to leave no tip and explained to the bartender why they were refusing to pay the mandatory tip. The bartender didn’t argue with them, just took their money for the bill ($73.87) and promptly called the police and had them arrested for not paying the 18% tip. In this case, within a week the Northampton County District Attorney asked the police to drop the charges against the couple, noting that this type of thing should be processed via civil court, rather than criminal. The police then dropped the criminal charges. Up until very recently, it was considered inappropriate in the United States to tip an owner of an establishment, regardless of whether they were the ones serving you. In the last few decades, this has changed, as has the standard tipping amount at restaurants, which in the 1980s was 10%-15%, but in the last couple decades has inflated to 15%-20%. A study done by Cornell University found that the actual quality of service received by an individual did not correlate with the amount of tip. Much stronger correlations, in terms of tipping amount, could be found based on how attractive the server was and/or how much the total of the bill was. So more a “self-imposed wealth tax”, in that someone who can afford to pay for more expensive meals will generally pay a larger tip, regardless of service. Two other similar studies showed that minorities receive significantly lower tips than white people, regardless of bill price, even when the people leaving the tip were also minorities. One of the principle arguments for tipping is that many establishments where tipping is the norm get away with paying their employees under minimum wage, because of tips making up the difference. However, this is not the case in Alaska, California, Minnesota, Montana, Nevada, Oregon, and Washington, which all require employees to be paid at least minimum wage, regardless of whether they receive tips or not. Despite it being Federal law for people to report tips on their income taxes in the United States, the IRS estimates that about 40% of all tips received by individuals are not reported on those people’s income taxes. In some border cities near Canada, certain U.S. restaurants set a mandatory tip of 18% for French speaking Canadians that have come down to the US. This is often referred to as the “Queeb Tax”. “In fact, pretty much anytime you’ve ever heard of a word that originated before the 20th century coming from an acronym, you can be almost certain that it isn’t true.” – Not true. A quick example: POSH = Port Out Starboard Home for English going to and returning from India. Recently in my local bar an old man came up to me, He must have been in his 80’s. He tipped the waitress I was speaking to and turned to me and my friend and said “Do you know where the phrase to TIP comes from” Or something to that extent ! He went on to explain that it means to insure proper service and back in his day (as he put it) They used to pay tips before they ordered. I have heard the same explanation from an older gentleman about twenty years ago. He had added that not only did the people place the tip on the table in the beginning of service but the tip would begin to disappear bit by bit with each disliked service given. If the cups weren’t filled on time…. monat would be taken from the pile. 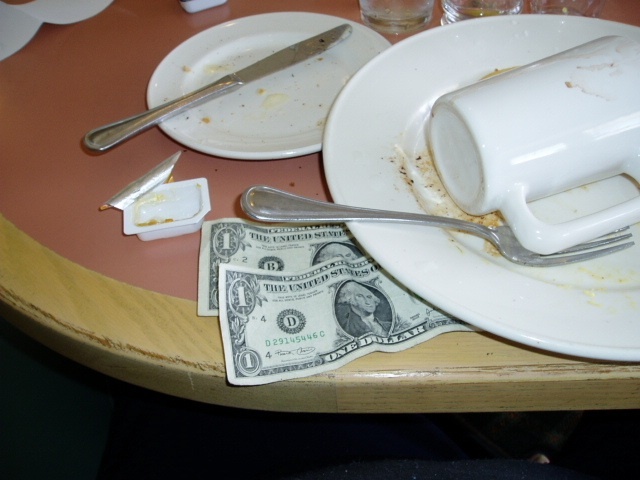 It’s an American thing not to tip till the end of a meal most of my foreign clients tip beforehand. Actually, its common in Europe to tip after the meal. So I wouldn’t say it’s an American thing. You were doing so well until you mentioned ‘Queeb Tax”. Unnecessary. If a major portion of society deems the word tip to mean: To Insure Prompt Service then that is what the definition of the word is. Take the word GAY as an example and precedence, where the original meaning of the word is replaced and regulated to being a “dated” definition. Your definition of TIP coming from Thieves’ Cant my be the original (and thereby dated), but the acronym is more common and accepted definition. The acronym is not a more common and accepted source of origin since it is not the origin; it is also not an accepted definition but is nothing more than a clever acronym someone came up with. That’s fine, but this isn’t discussing the DEFINITION of the word, it’s talking about the ORIGIN. And To Insure Prompt Service is incorrect. It would be ‘Ensure’.